The Tyneside Stages Rally 2015 saw Sara Williams tackle tarmac in her V-Ex Virtual Exhibitions sponsored Group N Subaru Impreza rally car for the first time; registering a finish of 6th in class and 12th overall. Sara and co-driver, Michael Gilbey, gained valuable experience on tarmac and achieved a solid performance; illustrating Sara’s expertise extends well beyond her skills on gravel. The Tyneside Stages Rally was this year held on the 2nd August 2015 at Otterburn Army Ranges near Newcastle. The event is the 4th instalment of the BTRDA Mixed Surface Championship, a series that mixes evenly between both gravel and tarmac rallies with the aim of finding the most competent driver across both disciplines, with a selection of scores from each surface collated at the end of the season. The event is organised by Alnwick & District Motor Club in conjunction with Berwick & District Motor Club, pairing with rally sponsors Motoscope. The Tyneside Stages are characterised by narrow snaking asphalt and numerous hazards including bridges, ditches, fences and gates. The course is famously unforgiving; combining random bumps, fast sections, twisting corners, high speed jumps and crests all within close proximity of each other. While offering more grip than a gravel surface, the increased speed attained on the stages ensures the margin for error on asphalt is similarly fine. Sara and Michael headed to the start line having never tested the Subaru on tarmac, so the event promised to be a steep learning curve for the Brecon Motors Team. In the morning the crews were greeted by damp conditions, as overnight rain soaked the tarmac across the course. The day promised to be a stern test for all competitors. Dudlees 1 was the first and longest of the day’s 13 stages, introducing the drivers to the rolling moorland and sparse woodland of Otterburn in spectacular style. A fast stage with plenty of straights, Sara and Michael found themselves in 15th overall by the finishing post with an impressive 8:20, a sterling time considering it was the Subaru’s first time out on the tarmac. Stage 2, Riverside 1 was in contrast the shortest stage of the rally, measuring 3.89miles from start to finish. Sara and Michael again posted a commendable time, posting the joint 11th fastest stage time and consolidating 15th overall. Makendon 1, the day’s third stage, was another course characterised by long straights - but also incorporating tight corners and technical sections guarded by black hay bales. Sara and Michael again kept things consistent, finishing the stage 15th. Sara was undoubtedly coping with the different demands of tarmac rallying – her trademark consistency shining through despite a new challenge for her rally machine. With the roads drying out, Sara could really push on. A re-run of Dudlees was the events fourth stage, putting the drivers through the day’s most gruelling run for a second time. Sara shaved a whole 16 seconds off her earlier time, with her and Michael climbing to 14th as a result. Despite the new demands placed upon it, her trademark Subaru was running faultlessly. Riverside 2 was next, with Sara and Michael keeping hold of 14th. A re-run of Makendon however saw the team gain a place, leaving them in 13th overall after 6 stages. Stage 7 saw the introduction of Davyshiel, one of the shortest of the rally stages but also one of the fastest, beginning with a long and enticing straight. Sara and Michael kept pace and kept their grip on 13th. Stage 8, Watty Bells 1, followed a familiar pattern, with the pair holding position by the stage end. Stage 9, Bushman’s Crag 1, again saw great progress for Sara and Michael. Hurtling along the stage’s sweeping corners across the moorlands, the duo jumped a place to 12th overall; Sara’s increased confidence in her Subaru’s tarmac abilities clear for all to see. The next stage, Davyshiel 2, saw Sara hold her nerve and retain 12th overall, with a 14 second gap back to 13th position heading into the last 3 stages of the rally. Watty Bells 2 constituted stage 11, the day’s penultimate challenge. Sara took 5 seconds out of her previous drive, heading into the final stage in 12th with an 8 second gap to 13th. The finale of the rally saw Sara and Michael take on the stage that had won them their overall position earlier, Bushman’s Crag 2. On the high speed corners and teasing technical sections, Sara and Michael powered through the stage, claiming 12th overall by 9 seconds and finishing 6th in their class, an astounding result considering Sara had never driven the Subaru in anger on tarmac before. Team Brecon Motors will be competing in another tarmac rally in the shape of the Mewla Rally, an event that is in close proximity to the team’s headquarters. However, despite the 9 hour drive to Otterburn, the entire team were delighted to have come away with so many positives from the event. Number 1 British female rally driver Sara Williams showed her versatility and adaptability on stage throughout the rally, taking into account new challenges and extracting the best from her Subaru impeccably. Williams has again proved the rounded nature of her driving skills and race craft, showing maturity in guiding her car around a high-speed course that can punish the unwary. Achieving this in a car untested on tarmac and with a faulty intercom illustrates the inherent class she has shown throughout her motorsport career. Furthermore, with solid performances and experiences such as these under her belt, she can only get better. Sara now lies 5th in the championship, with the standings promising an exciting second half of the season. 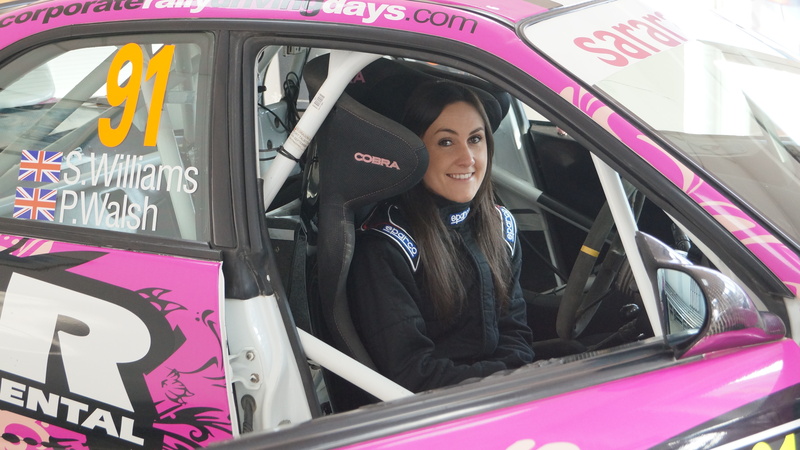 Check out the in-car video of Sara on stage at the Tyneside Rally 2015, accompanied by co-driver Michael Gilbey. Photo Caption 1:#1 British female rally driver Sara Williams in her V-Ex sponsored Subaru Impreza Group N rally car.